Santa Claus is coming to town for Christmas. Vancouver Santa Claus fans have many chances to see the big guy during the 2017 Christmas season at free mall appearances and popular holiday attractions. If you want to combine a visit and photos with Santa with your holiday shopping, the place to do that is at one of several area shopping spots. If you'd rather make a fun family outing out of this traditional annual ritual, you can let the kids meet up with Santa at several holiday events in Vancouver. Or you can do one of each and let the children make additions or subtractions to that all-important list. Visit Santa's workshop as part of Grouse Mountain's Peak of Christmas event. You can visit Santa and participate in other attractions like the Light Walk, Sliding Zone, sleigh rides, Santa's reindeer, and Children's Gingerbread Village for the price of just one ticket per person. Santa will be at Grouse Mountain from 11:00 a.m. to 8:00 p.m. daily from November 25 through December 24; on December 24 he closes up shop at 4:00 p.m. to get ready for the big night ahead. Hours of other events vary; check the website for specific event details. You can visit Santa at Richmond Centre Tuesday through Sunday from November 18 through Christmas Eve, December 24. Santa will be in the Main Galleria of Richmond Centre; Santa's regular hours vary by day, so check the website for the details for the day you want to visit. Reservations, made online, are encouraged, but if you just show up Santa will try to work you in. But that could mean a very long wait. Visits with Santa are free; you have a variety of photo packages to choose from ranging in price from $25 to $40. 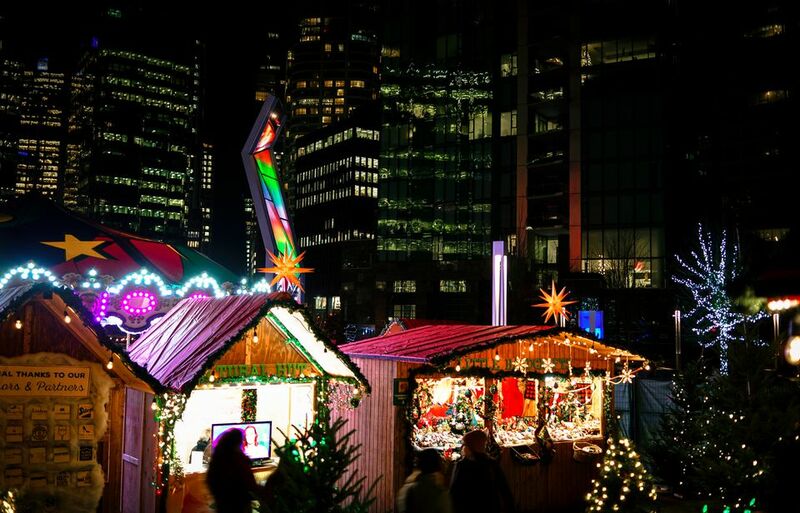 Making a stop at the Vancouver Christmas Market is a Vancouver holiday tradition. Combine that with a visit to Santa, where the kids can sit on his lap, tell him their list, and get a photo taken. Santa will be at the Christmas Market Photo Hut every day from November 22 through December 23 from 5:00 to 9:00 p.m; he will be there from 2:00 to 6:00 p.m. on December 24. Get a photo of your children with Santa that will bring back memories for years at Metropolis at Metrotown. Santa will be there every day from November 14 through December 24, Christmas Eve. Santa will be holding court in the Grand Court (of course) on the Lower Level. Hours are in intervals from 11:00 a.m. to 8:00 p.m. Monday through Saturday, from 11:00 a.m. to 6:00 p.m. on Sundays in November, and from 11:00 a.m. to 8:00 p.m. on Sundays in December, except for Christmas Eve, when the hours are 11:00 a.m. to 5:00 p.m. Plan for a long stay in the mall; average wait times are 2 to 2.5 hours. The good news is you can register and get a text when it's your kids' turn to sit on Santa's lap. Photos with Santa are by donation, with $3 a suggested minimum donation. You'll get your photos digitally via email. The kids can have a chat with Santa Claus and get their picture taken with him at the Railway Plaza's North Pole from November 30 through December 22 from 4:00 to 9:00 p.m. and from 1:00 to 9:00 p.m. on December 23 and 24. Photos are $10 each. While you're there, ride the train through the park, decorated with 3 million lights. More than 1 million lights put on a sparkly holiday show at VanDusen Botanical Gardens from December 1 through January 7. (It is closed on Christmas Day, December 25.) You can have your photo taken with Santa and listen to holiday stories every day through December 24 in the Glasshouse. It's free with a ticket to the Festival of Lights. Hours for the Festival of Lights are 4:30 to 9:00 p.m. December 1 through 14, 4:30 to 10:00 p.m. December 15 through 24, and 4:30 to 9:00 p.m. December 26 through January 7. Santa Claus makes his grand yearly appearance at Kids Market at Granville Island on December 2. He will be receiving guests every day from then through December 24, Christmas Eve from 11:00 a.m. to 3:30 p.m. except on December 4, 11, and 18.